Celebrate Ravine Day at Evergreen Brick Works on May 12. Our family-friendly celebration includes guided walks, stewardship activities, performances, community art programming and more! Join Evergreen and partners as we explore the wonders of our ravines. It’s the perfect day to come down to Evergreen Brick Works and celebrate getting active in the Valley! Stay and play, then peruse the opening day of the Sunday Artisan Market. With different activities happening at various times throughout the day, make sure to check our schedule in advance. Support local songbird populations by purchasing birdhouses made by local youth from Trade Connect, a program run by the Neighbourhood Organization connecting new immigrants with skill building programs which support future employment in the trades industry. Then, be sure to visit our paint table to decorate your new birdhouse. Join naturalists Pat Kelly in building bee hotels to support the diverse bee population in Toronto. Using tools and materials, participants will build their very own bee boxes to take home with them. Bees are critical to a healthy and resilient ecosystem and building these homes is a step in supporting their populations. Join us in the Children’s Garden where we’ll dig in and explore water through the lens of plants and animals. Activate the imaginations of children while we learn about the magical world of the ravine system. Enjoy delicious foods and wares made by local artisans at the launch of our annual Sunday Artisan Market! Grab a meal and enjoy a picnic at Evergreen Brick Works to celebrate Ravine Day and Mothers Day! Eric Gold’s process involves painting together as a collective, creating works of art that are a metaphor for the community: made up of individual pieces that are unique and expressed differently, but united create a new self that is larger than the sum of its abstractions. Participants will paint individual segments of a larger image. When the pieces are assembled together they will create an image of an inhabitant of the Don Valley. What will it be? Join us to find out! The painting process is open and inclusive to people of all ages, backgrounds, languages and technical abilities. Join Outward Bound for a guided walk through the Don Valley Brick Works Quarry taking in the sights and sounds of spring. Walks are family friendly and 1 hour long. We’ll show the Valley some love by doing a litter clean-up in the surrounding area. 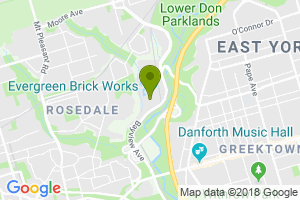 Join the Don River Valley Park Advocate team to learn more about the geography and local ecology of the Don Valley ravine system. Through hands-on activities, we’ll pour over maps and craft activities. Ojibiikaans is a non-profit organization that specializes in land-based teachings for indigenous families. They are at Brickworks every Sunday from 10am - 3pm. Their focus is on teaching Anishnabe language that deals with land-based education. If you would like to learn an Indigenous words or certain words, come by and learn with us. Meet the Worm Wrangler team to learn about vermicomposting. Get a chance to get up close and personal with the worms and learn about their unique and important task in supporting plant health. How much energy does it take to get your glass of water? Hop on The Pedal Project and find out! The Pedal Project is a bicycle-powered water pump that shows how much energy it takes to pedal one glass of water from Lake Ontario to your tap. Come, re-connect with, and celebrate your precious glass of water. Join Waterfront Toronto for a virtual reality tour of the new Don River, already under construction. When completed in 2024, this new river valley through the Port Lands will help protect an area as big as downtown from flooding. The Port Lands Flood Protection project also includes new parks and green spaces, new pipes and underground infrastructure – and new bike trails, roads, bridges and trails to connect it all. With limited parking on site, we suggest considering alternate methods of transportation. See all the ways to get here.